CRUMPET leopard cashmere top (here). ASOS peplum skirt (here). REBECCA MINKOFF clutch. MICHAEL KORS gold watch (similar here). This entry was posted in Details and tagged crumpet leopard cashmere, Michael Kors watch, peplum skirt, rebecca minkoff clutch by Carolina Engman. Bookmark the permalink. wow, the leopard top is so 3Dish! Love your detail-pics! So fun!!! I looove leopard print! Your skirt and purse are fabulous! Stunning! I will dream of that clutch until it is mine! Love love love the clutch!!! oh my god the bag! this Clutch is Amazing. I am in love! Where can I buy that? Cant find this piece on the Minkoff Website?! I just saw your photo in this outfit on the Asos site! Totally jaw-dropping look. Definitely inspiring, girl. That clutch is insane. Love it. I thought it was the Zara peplum skirt but this Asos one is really nice too! oh my gosh that Rebecca Minkoff clutch is to die for! can’t wait to see the entire outfit! Absolutely besotted with your clutch Carolina! I’m so jealous of your bag, it’s perfect! This is amazing! Can’t wait to see the whole outfit. Love this outfit already! Skirt and bag are stunning! Even though I don’t like animal prints at all, the combination with the peplum skirt makes it look fantastic! Chic! Cannot wait for the outfit! Looks vampy-meets-babydoll and something tells me I’d really enjoy it. Looks really interesting!! Waiting to see the whole outfit!! OMG completely in love with the bag, awesome! So damn pretty! Can’t wait to see the entire outfit! Beautiful oicture and already looove that skirt!! LOOOVEE that bag!! It’s so amazing! Que bonito el bolso, me encanta como te queda con este look. BY THE WAY! what do you think about MARGIELA and H&M COLLABORATION? I’m SHOCKED! Loving that clutch with leopard! This look is fantastic…I want everything! Omg. Love how you styled the peplum skirt.! 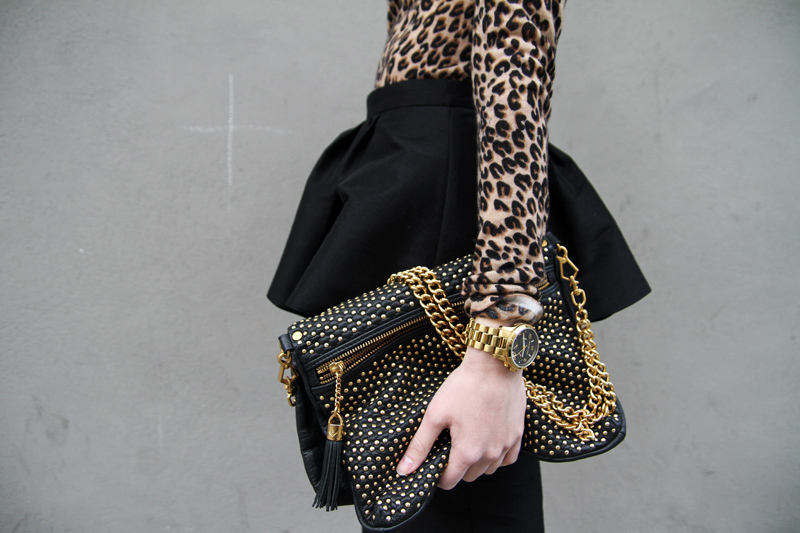 Great look and style, love the clutch bag, this is really my style, black, gold and leopard print. Elegant and really Italian! Wahh so pretty… I want! !